Watch out Captain Sillyvoice! There’s a new Captain in town. The next Captain Sillyvoice book is on its way soon. Just to give you a taste of what’s to come, let me introduce Captain Scaryscar. And a quick reminder that 3 copies of the first book in this series, Captain Sillyvoice and his Pirate Band, are being given away in the Goodreads Giveaway. The closing date for entries is 12 February 2014. 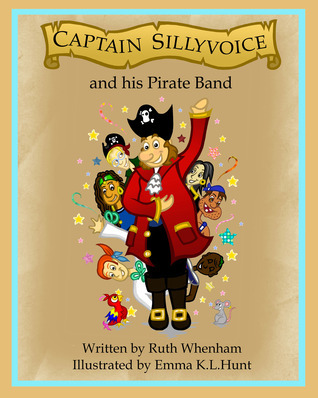 Captain Sillyvoice Book Review by "Readitdaddy"
Something very exciting has happened today - my book, Captain Sillyvoice and his Pirate Band, has been reviewed by a top children' picture book blogger. Do take a look! Check out this Goodreads Book Giveaway for Captain Sillyvoice and his Pirate Band. Goodreads is great site for anyone who loves reading (adult and children's books), so it is worth taking a peek anyway! Giveaway ends February 12, 2014. I have the opportunity to update the cover of my book, My Crazy Purple Pen (originally released in 2012).To help me decide on the new cover, I put out a Facebook post featuring the original cover together with 6 alternative options. I also sought feedback from other friends and family. Thank you to everyone who gave me their feedback. It has to be said that there was no clear front runner, but it does seem that the addition of the stars and ink spots is preferable to the characters. The designs without any additional features were least popular. The addition of the purple/pink border was preferred by quite a few of you but I am concerned that this colour scheme may make the book less appealing to boys. The cover with the blue border creates a more gender neutral design overall and is very eye-catching but perhaps too much so! So, I have made a decision. The new cover can be seen below and should be available within the next few days. Thoughts drifting to memories cherished. The man smiles, happy just to be. Soundless; without purpose it seems. A mistress to the whims of the wind. The wind comes to call. By chance some will spark new life. At the gate some flakes resist. Writers on writing – you’ll enjoy these! I have today stumbled across some fabulous and thought provoking quotes from some terrific writers. They are definitely worth sharing. I hope you enjoy them as much as I do. Terry Pratchett, in back matter for A Hat Full of Sky. Next, we move onto another of my favourite authors, Roald Dahl. Not only was he a brilliant storyteller but his poetry is genius too. If you haven’t read his book of revolting rhymes for children, described as a collection of nursery tales with bite, then I suggest you do so! Philip Pullman, 1996 Carnegie Medal acceptance speech. "Picture books are for everybody at any age, not books to be left behind as we grow older. The best ones leave a tantalising gap between the pictures and the words, a gap that is filled by the reader’s imagination, adding so much to the excitement of reading a book." Anthony Browne, UK Children’s Laureate, 2009-2011. "I think books for children should be wild and adventurous. They should offer you something you can escape into, something you don't get later on--it might be the only chance. It's the only time that children can develop their imagination and it's so porous it's vital to fill it with extraordinary things, not mundane, boring things." Emma Chichester Clark, as quoted for the 2003 Magic Pencil Exhibition. Harold Goddard, The Meaning of Shakespeare. If anyone has come across other great quotes on writing, particularly for children, then I would love to hear from you. Please do feel free to post on my website or on Facebook.